The Sacristan Engineers of the Sacrosanct Chambers hail from the Ordinatus Conclave – sometimes known as the Conclave of the Thunderbolt for the devastating effect it can have on battle. These warrior-engineers command the chambers’ magical field artillery. When a Celestar Ballista is set up to defend a sacred site, approaching too close can mean an explosive death. Their rune-inscribed projectiles are filled with coils of stray lightning coaxed down from the top of a Sigmarabulum, and are launched like streaks of blue-white energy at the foe. Should their strike be true, they will blast right through the target in a chain explosion of arcane force. 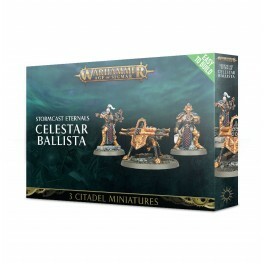 Designed to be as easy as possible to assemble for new hobbyists while being detailed enough for the hardiest veteran to appreciate, this kit assembles a Celestar Ballista, crewed by 2 Stormcast Eternals Sacristan Engineers. Push-fit, with no glue required, this kit is incredibly straightforward to put together and comes on pre-coloured gold plastic. The Sacristan Ballista is a powerful launcher, which sits on a tripod and is attended by 2 Sacristan Engineers. The Ballista itself is aggressive and slightly spartan, effectively a large armoured crossbow. At the front are 4 barrels, which launch the runed bolts, with armour plates featuring a lion motif and inscriptions. From above, the loading mechanisms are visible – rather than firing the rather unstable energy-filled bolts directly, cartridges are used to load artillery into the ballista. The Engineers are armed with sigmarite blades, though this is not their primary equipment – they hold measuring equipment, compasses and cartridges, all used to calibrate, load and fire the Ballista. There is a helmeted Engineer and 1 unhelmeted; both feature the iconography of the Sacrosanct Chamber. Extra details for the base are included, with an ammunition box full of cartridges, and another box filled with spare instruments. 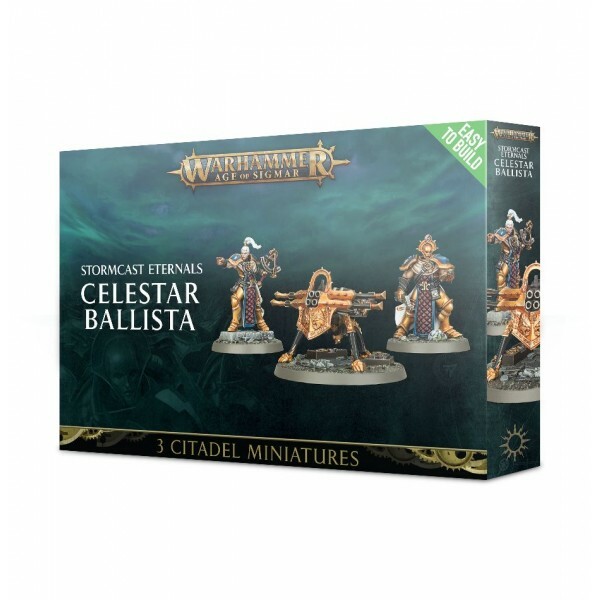 This kit comes as 17 components, and is supplied with a Stormcast Eternals transfer sheet, a Citadel 60mm Round base and 2 Citadel 40mm Round bases.